What´s about the ecological footprint of a building? The average lifespan of a residential building is about 80 to 100 years (Central Europe). The efforts for the construction of the building are at the beginning of the observation period. In between efforts for the maintenance and repair must be spent. At the end the lifetime disposal will have to be done. Most people know the expenses for the operation and heating of their residential building. But only a vew of them have any idea how much energy for the establishment and maintenance or disposal of your building is required. Scientific calculations show, depending on the material choice and construction design, that there can be very large differences between the ecological efforts for building construction. 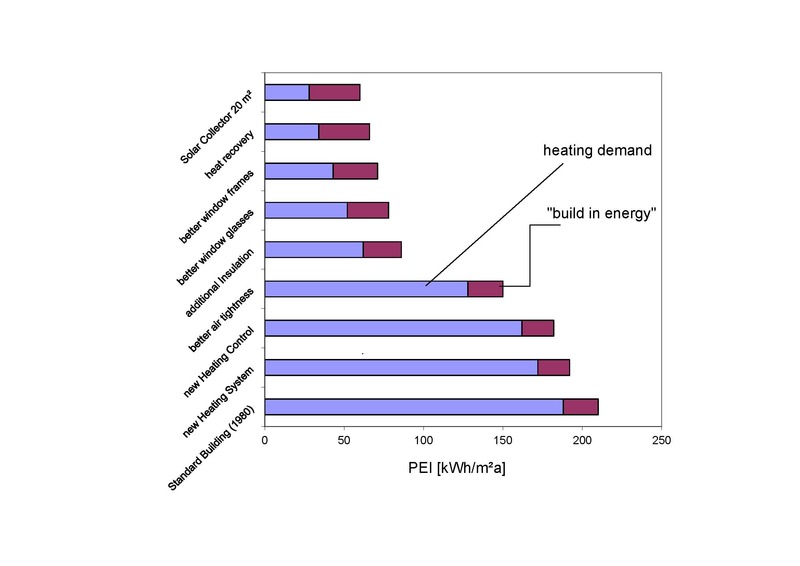 It is quite surprising that this effort is of the same size as for the heating of the building over the whole lifespan. It means that a sustainable design of a building is not only a building with low heating energy demand, but it is also necessary to choose the right building materials and construction design. The optimization potential is thus about 50%, especially for passive houses and Nearly Zero Energy Building of practical relevance. Optimization of ecological footprint deals with the right choice of material and construction design. 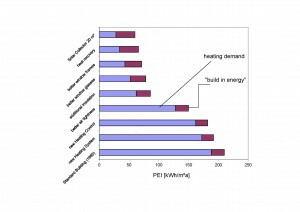 On the one hand it is important to choose materials with low primary energy input for its production i.e. of renewable or readily available resources, on the other hand the maintenance efforts should be low as well lifetime should be long. It can be shown that the Primary Energy Input for the same service unit (treated living space) could be divided by 2. ECOSOFT is a software for the ecological assessment of building components and buildings. It was developed by the IBO and is available online at baubook Eco2Soft. Thus the ecological impact of new buildings, refurbishments and disposal processes can be quantified easily. The choice of environmentally compatible building materials should be made as far as possible on the basis of scientific, or at least reproducible, findings. A good basis for comparing building materials as objectively as possible is a quantitative method, such as that of impact-focused classification, which produces environmental indicators such as greenhouse gas or acidification potential. Building material characteristics are used for component evaluation and optimization. Components can be joined together forming a whole building. So the ecological footprint of a building can be calculated. Calculations can be performed for new constructions and also for renovations. In the calculation, construction and maintenance costs are measured. At the end you can see the total primary energy input, the greenhouse gas emissions as well as acidification caused by the construction and the maintainance of the whole building but also for parts of the building. You can do an analysis of the most incriminating parts of the building and make comparison of alternative plannings.